As promised, here is more info on the tree skirt pattern I was working on last week. Sorry for the delay – my family and I spend a few delightful days in Disneyland this week – a much needed break! The finished tree skirt measures 54” in diameter across the widest point. Right now I have pdf patterns available for purchase in my pattern shop as well as my etsy shop. Love it! thanks for sharing it, I was looking for a simple tutorial and this is perfect! 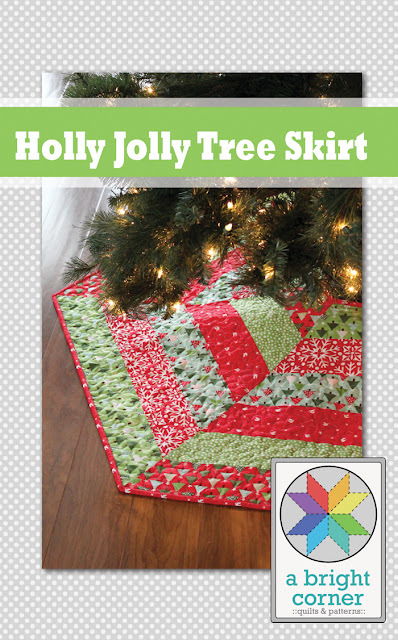 I just pieced my tree skirt this evening, and it was so slick and easy, with your awesome pattern! I can't wait to get it all quilted and bound now!!! What kind of ruler are you using to measure the angles? I did a practice round on paper using a quilting ruler and it came out a little off. Plus it was hard to line up the angles because of where they are on my ruler. Thanks! Beware that the strips need to be 44 inches or you won't get the trapezoids. Really disappointed that I prewashed fabric and now am stuck with a pattern (and fabric) that won't works. Hi Vicky - sorry to hear about your frustration. There is a warning on the pattern that any fabric less than 43-44" won't work. But I have good news for you! There is a way you can still make the tree skirt from your shrunken fabric. And it's a fairly simple solution too- I can explain it in detail to you through email if you'd like. Email me at abrightcorner@gmail.com and I can help! I occurred to me that I could stairstep the strips - creating a parallelogram which was then big enough for the diagonal cuts. Thanks for your response, though, and I'm happy with the results, so far.